Tap your way to fun, fitness and friends. 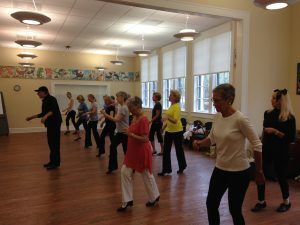 Come join Boca Grande’s favorite dance class on Thursday mornings in the Houghton Room. Learn to tap with Chris Lee, a nationally known tap dancer and choreographer. His method makes it easy to progress at your own pace. There’s lots of personal attention, too. You’ll dance to fabulous music, giggle a lot, and enjoy learning steps that channel your inner Fred and Ginger. You’ll find yourself dancing all week! Classes are $20 each, collected weekly. For more information, contact Carol Forrester: (404) 580-9223.